Disney’s Zootopia has quickly climbed to the number one spot of… well, pretty much every list, it seems like. An incredible score of 98% on Rottentomatos, 8.4/10 on imdb and it even broke Frozen’s opening week box office record (gasp). So, what is it that so many people like about this film? 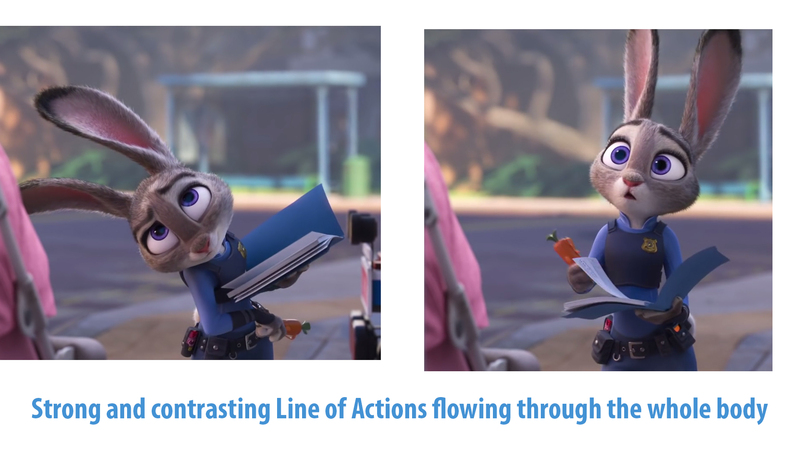 Let’s take a look at what makes Zootopia special and what we as animators can learn from it. The film borrows heavily from the beautiful design language that Disney artists collectively developed over half a century. The current Disney animation crew took some the best elements from classics like Robin Hood or Bambi – they had a close look at how legends like Milt Kahl and Glen Keane fill their characters with energy, and transported it into 3D. Such a flow and rhythm rarely seen in CGI. While 3D is fantastic at keeping volumes realistic, it becomes very problematic if you want to let energy flow throughout the whole character. 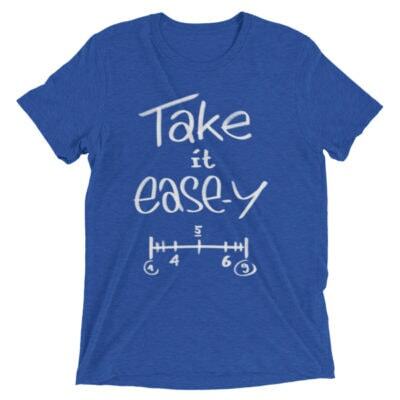 There is often a rig limitation in the way that makes it seem… stiff. Not here, though. Elbow and shoulder lines are just exactly as pointy or flowy as they need to be. The line of action goes through the whole body (and some secondary lines through legs and arms), but there are also some intentionally placed points and straights to contrast the flow – just like it would come out of the pencil of an old Disney legend. Even the cloth simulation is on board with that: Look how the fox’s sleeves stand out just as much or as little as they need to, instead of doing whatever simulated gravity tells it to do. Plus, but I am sure you already noticed, the character designs are unbelievably cute and charming. The internet branded the film as “the movie for furries” way before the release, which made me notice that there hasn’t been a film with such a strong (and well made) “animals that live like humans” theme for years. Well, this one is surely a winner when it comes to furry animal design, and it’s because the designers, modelers and riggers actually invested an insane attention to detail to translate this appealing look from 2D to 3D. 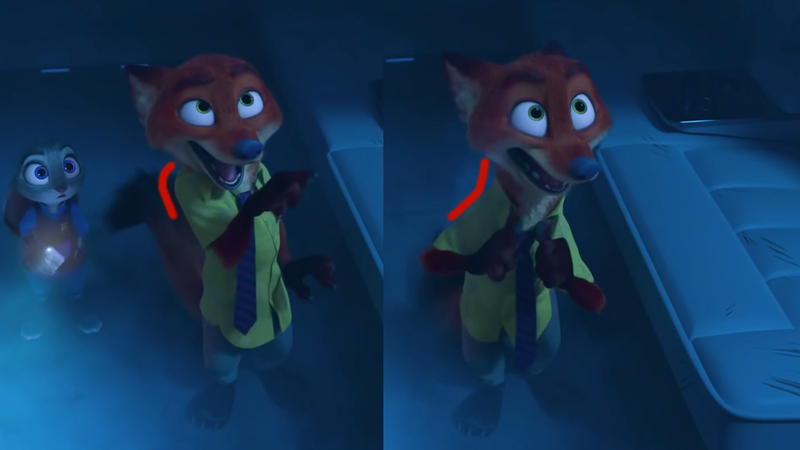 Zootopia is shaped by its inhabitants: It is split up into different climate zones, the trains have small, medium and large doors, a smoothie booth is shown with a pipe used to take drinks up to giraffe customers, cars come in all shapes and sizes to fit their drivers, and there is even an entire neighborhood that is miniature – perfect for its rodent population. This is an explosion of creative ideas only possible in animation. It’s also interesting to see those cartoony designs from older times interact with smartphones and computers. For once the mandatory pop-song at the end of the film actually feels like it comes out of this world. The mix between a timeless message in a modern environment is a refreshing view. Alright, it looks good, but what about the story? It was really, really good! Was it something we have never seen before? Well… actually… no. Right from the beginning it’s pretty obvious that this is another “you can achieve your dream if you try hard enough” film. And while I could understand how someone might not be in the mood to hear this yet again, Zootopia is one of the best takes on this classic story that has been done in a long time. Sprinkled with some crime mystery on top and very charming characters, this is a real treat. And the filmmakers didn’t make it easy for Judy, a bunny who wants to be the first bunny cop. She hits brick walls on her path, even seems to genuinely give up for a short moment (which is rare in cartoons) and then in the end succeeds through an actual achievement – not just by believing in herself (I am looking at you Dreamworks’ Turbo). We have plenty of time to witness how hard Judy works and how kind she is. We are not just told this, we see it. And then we see how she is treated unfairly, has to fight and wins, but then there is a big flip side to the coin that has to be sorted out. Classic storytelling, masterfully executed. It fits ancient storytelling structures, but it still feels like all came from the heart. Why reinvent the wheel if we already found out that round wheels are the best? Frozen drove on triangles, Big Hero 6 on squares and Tangled on hexagons. Now, finally, we get a Disney story that flows how a story is supposed to flow. On top of that, we get one of the most prepared twists in the history of twists. It almost seems like they were taunting the controversial villain “twist” in Frozen. Literally, from the first scene on we start to collect puzzle pieces. Every scene has it’s place, has a reason and triggers the events that follow. And seeing it all fall into place in the end is a pure delight (Okay, you might be able to guess some parts of the puzzle’s picture before the characters, but for me that was fun too, because it had some nice “Oh no!”-moments). Genre-wise Zootopia is a crime mystery with a hint action and several splashes of comedy. While this is kind of a trope area for live action, the creators make full use of the playground that is animation. Only in animation and comics can a crime have fantasy elements that effect the whole city so quickly. For some children, this might be the first time they experience a crime mystery story and adults can enjoy quite a few allusions to known TV series and film classics. While the actual secret is a bit simple after we are given all the puzzle pieces, the filmmakers mange to keep up the tension and variety. We get some witty teasing between the main characters, a lot of intense investigation and unusual action scenes. The few logic holes and story conveniences (why are those people there at this exact moment?) can be generally ignored because the characters are just so charming and you just want the story to continue. This is a weird fact I have observed over the years, but it keeps surprising me – if the characters are charming and have a wonderful chemistry, you can forgive almost everything (like the “The Sword in the Stone”, which is so wonderful because of the characters, but the story is actually pretty weak). The theme of the film is just as old and familiar as the story: It’s all about being tolerant and avoiding prejudice – nothing that should be new to anyone. And given that racism and bigotry sadly are still alive and well, all around the world, it makes the film highly contemporary, while taking a timeless look at human nature. The film also brings up “accidental” discrimination – how each and every one of us might say something insensitive without any bad intentions. The movie has quite a few jokes about such awkward situations, some of which adults will understand more than kids. In one key scene even our kind protagonist says something without thinking about it first and it’s painful to see how the situation goes downhill. Far further and sincerely downhill than most kids films would take it. A bold decision that pays of with an invested audience. Well, actually, some of the younger kids in the audience might start to get a bit bored and restless during the more talkative parts of the movie (at least they did in the theater I was in). They seemed to enjoy the action scenes, but some of the psychological drama that I found so captivating, might have gone a bit over their head. A big contribution to the story’s drive is the dynamic pairing of the two main characters. Judy, the optimistic and idealistic bunny from the prey side of the world, and Nick the fox, a scam artist who came to terms with life’s rough edges on the predator side. This setup alone has constant conflicts built into it, a vital ingredient for fantastic acting. 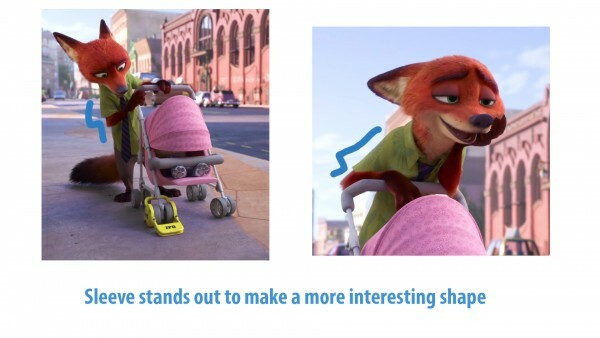 In some interviews the directors reveal that they decided to make Judy to the main character instead of Nick after animation had already started. This was a very bold and risky move that ended up being the perfect decision. Seeing the world from her perspective just allows for so much more conflict and development and, therefore, allows the audience to identify with her better. 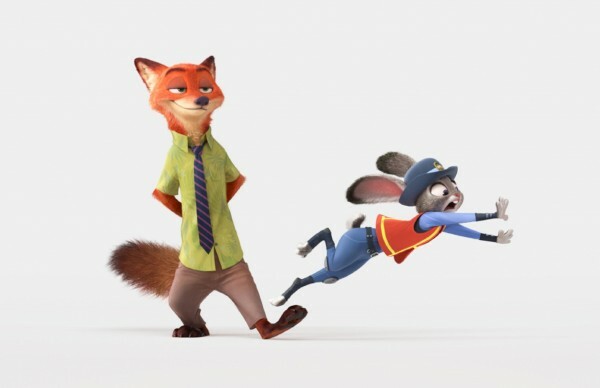 The animation in Zootopia is absolutely delightful and a lot of fun. Actually, even the weaker Disney films were always brilliantly animated. Unlike the weaker films, though, the characters are actually given great material for very believable acting performances. Because the story is so very well structured, the characters never run out of objectives and obstacles, which are the foundation of every decent acting performance. On top of that, the animators take the pressure on the characters to the maximum, and because it feels authentic, we feel with them. Visually, the animators continue what the designers started. Not only the models contain an excellent design language, but every pose is filled with rhythm, flow and energy. Some shapes especially around the shoulder come and go when needed just like they would in a drawing (this can be extremely tricky in 3D). So many animals have tails, which allows for some especially pronounced lines of action, and Judy’s long bunny ears extend her emotions so wonderfully. I can’t wait until I can study some scenes frame by frame. It’s also remarkable how every animal in Zootopia moves and walks differently depending on the species and personality (and there is a lot of walking and running in this film, so there’s a lot to take in). But I don’t want to go on forever… We might have a detailed look at some specific scenes at a later point in time. In my opinion, there are a ton of great elements in Zootopia and the praise is well-deserved. Always strive for as much rhythm and flow in your design and poses as possible. Look for opportunities to make an arc run through arms, shoulders and legs, but set some well-placed points and edges for contrast. Make sure the world of the film fits to their inhabitants and vice versa. You can use tested and classic story structures as long as the characters and theme come genuinely from the heart. If a story develops in another direction, be brave and see if the new approach would work better. Have you seen the movie yet? What aspects stood out to you? Do you agree with the positive reviews? Share your views in the comments! Great article. I loved the film and will be looking forward for a more detailed analysis of specific scenes. Could you please explain a bit more the meaning of this sentence? Thanks. This is rlly cool and well thought! But… You made a mistake. Judy is the first bunny cop, not non-predator. Her own chief is a buffalo and those are not predators. Thank you very much for your kind words and the correction. You are absolutely right! I corrected it in the text. I finally had seen the Frozen and very agree with the author about plot mess. Beautiful animation and characters, but i have strong cognitive dissonance about all plot. 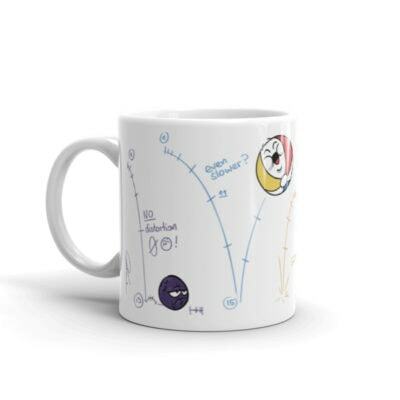 As for me it is fail with the scenario.